High Quality Content by WIKIPEDIA articles! 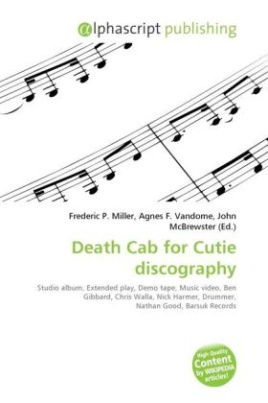 The discography of Death Cab for Cutie consists of six studio albums, five extended plays (EPs), a demo tape, a digital album, fourteen singles, eight music videos, and two DVDs. Death Cab for Cutie is an American indie pop group from Bellingham, Washington and was formed in 1997 by Ben Gibbard as a side project from Pinwheel. After releasing a demo tape, he added guitarist Chris Walla, bassist Nick Harmer, and drummer Nathan Good to the band. Death Cab signed to Barsuk Records and released four extended plays (EPs) and four studio albums through the label. The fourth album, Transatlanticism, reached number 97 on the Billboard 200 and was eventually certified gold in the United States. The group also issued nine singles and a demo tape through Barsuk. In 2004, the band signed with Atlantic Records, a subsidiary of the Warner Music Group. Their first release on the label, Plans, earned a platinum certification and charted at number four in the US.